I’ve been told by counterparts in the business that as a company grows, so will the need for formal rules and clear policies. With that in mind, I decided to beat them to the punch and make a couple of official policies. No Vacation Policy-Policy: This faux-policy is borrowed from Netflix’s Culture Guide: “No vacation-policy does not mean no vacation.” It just means nobody is tallying up how many days you take off because there is 12’ of fresh powder in the mountains. Or because you want to take a road trip with your kids before they’re too old to protest. Or because Venice is sinking and you’d better get there quick. We hire people who are relentless and empowered to get the job done, but trusted to make sure they take time off to unplug and return invigorated. Nobody should feel like their job or their manager is running their life. Asking for time off feels like asking your 3rd grade teacher if you can use the bathroom. We trust that you’ll do what you need to do, when you need to do it. Whether that’s putting in a few extra hours one day to meet a deadline, or taking a vacation. Just because you are new to the company doesn’t mean you’re less deserving of a vacation. Nearly-Mandatory Hotel Stay Policy: We created the Nearly-Mandatory Hotel Stay Policy to ensure that our whole team gets out to see and experience the unbelievable independent hotels in our network. Beyond official visits, each employee must stay in Stash Partner Hotels 2-3 times per year. The company covers the cost of the room as long as the employees report back on their experience. It’s nearly mandatory because we’re not going to penalize anyone if they don’t take us up on it. But why wouldn’t they? We need to see our industry and our product through the eyes of our members. Traveling is 10x more powerful (and 200x more fun) than crunching survey data. 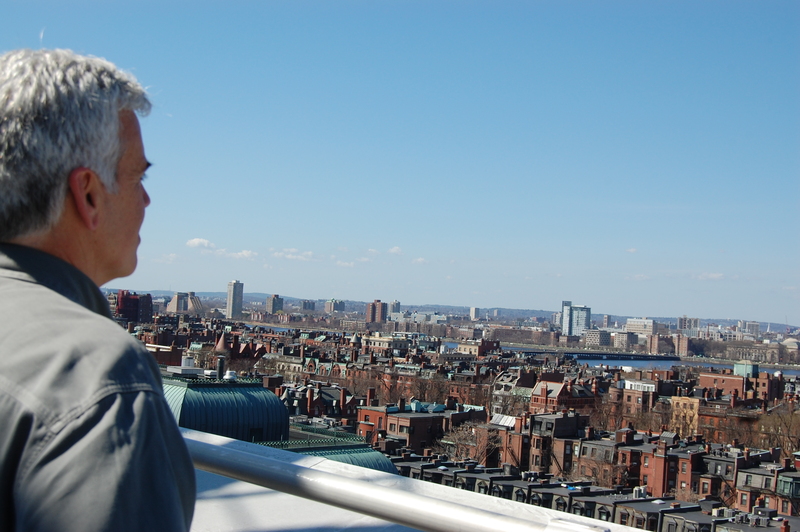 One of our fearless Partner Advocates, Frank, takes in Boston from the roof of The Lenox Hotel. And everyone, regardless of their position, needs to meet our partners, shake their hands, and dole out some hugs or high-fives (as appropriate). By visiting our partners, we learn world-class hospitality that we take into our jobs and lives. Above all, it reminds us why we love independent hotels, and why we fight tooth-and-nail to empower them to stay independent. As Stash grows, we’ll continue to add fearless travelers to our team. People with passion for meaningful travel, the heart to defend it, and the brains to do something about it. And unless we see more jorts at company events, I don’t see the need for any more policies in our future. Hi. I clicked the link to this article when I saw the picture of our hometown beer-drinking pig. (I live on the island of St. Croix.) Just wanted to comment that after reading this one article about your no-vaction-policy policy, I’m super impressed with the idea, the genius behind it, and your company. It’s so brilliant, yet so SIMPLE . . . natural, elegant, trust-based, genuine. Just the way one would vacation who worked for him or herself (as I do). Cool. Thanks for sharing such a great concept. Oh my God-what is wrong with you!!!? ?Why would you use that picture!?? Do you not see how wrong her stupidity is??? That poor animal does not need to be swallowing a can!!! Shame on you! Excellent piece. It’s a great reminder to existing companies that it’s important to let people’s life experiences in the door. It brings fresh ideas, and increased energy that is lost when employees are forced into a corporate box. It’s also a great read for new companies, or those growing, to remember that you can still have individual characters, and not to lose the energy, enthusiasm and teamwork that’s gotten you to you this point. Cheers to Stash! I commend your attitude towards the employees need to rejuvenate, take time off and enjoy the hotels you promote. Word of mouth and pictures such as the top one with Joy are worth more than an expensive marketing campaign and speak volumes to the consumer. Your company mission and standards of quality have made it possible to gain our trust and loyalty. If you’re ever in need of an unbiased opinion from a future property reviewer, look no further. Call me maybe? 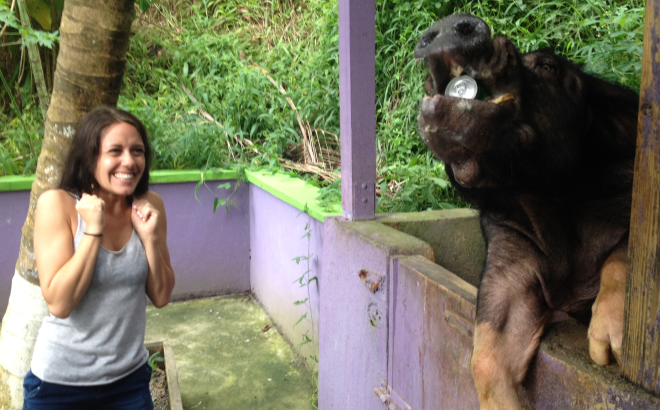 I’m shocked that you would promote a photo of a place where they allow a poor animal to consume an aluminum can. I can’t imagine that it’s good for the animal and I am disappointed that you would use that to promote what otherwise would be an interesting article.